At an early stage, the EPO's abstract sculptures were already shaping the look of whole areas of town. Stylistically reduced to functionality, tectonics and the visual appearance of materials, the monumental sculptures of Nicolas Schöffer, Phillip King, André Volten, Max Bill and Eduardo Paolozzi took their inspiration from the universal language of post-war sculpture, whose non-figurative perspective sought to develop a perfect utopian social model for modern cities. These works aspired to represent the vision of a new science-driven world order and to give expression to a fascination with technological aesthetics, speed and optimism about the future - to show that the progressive mind defines its world through numbers and mathematical proportions and therefore needs "intellectualised" art to represent this idea of progress. With playful humour, younger artists such as Jeppe Hein, Markus Stangl or Steven Rand challenge ways in which such city-based representative pieces are perceived, highlighting new aspects of civic participation in art in public spaces. That art at the EPO has an important communicative function was already clear when the Isar headquarters buildings were inaugurated in 1979. 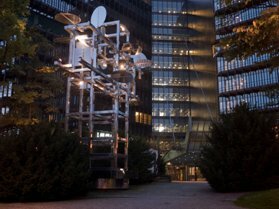 One of the first sculptures in the EPO collection was Nicolas Schöffer's 14-metre cybernetic tower, CHRONOS 10B (1979/80); when it swings into action at dusk and its rotating mirrors send colourful shafts of light into the surrounding area, the space resonates with strong urban symbolism. In the early 70s, during the discussion about where the EPO's sites should be, Munich - and more particularly the Erhardtstrasse site on the banks of the Isar, now Bob-van-Benthem-Platz - was put forward on the grounds that the libraries of the nearby German Patent Office and Deutsches Museum could be used for patent searches under the European Patent Convention. 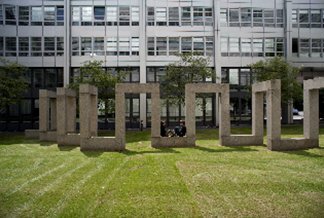 It was to symbolically reflect that synergy between the three institutions that Nicolas Schöffer's sculpture was commissioned for the main entrance. 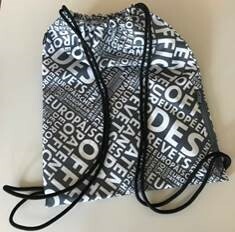 Collecting art means taking responsibility: in recent years, the EPO has committed additional resources for curating its substantial collection and preserving this culture for the future. To conserve these works - whether monumental sculptures in outside spaces, fragile objects, photographs, paintings, installations or drawings - the EPO draws on experts in a wide range of specialist areas, and sets high ethical standards for all restoration work. The individual artworks are so special that customised strategies are in place to prevent damage and to ensure optimal conservation. Preserving the collection's cultural heritage for the future has become a key aspect of our curatorial work, not just in the workplace but also for art in public spaces.